What tire brand are you using, & why ? Load range F or G ? Im looking into the 245's, high traction. 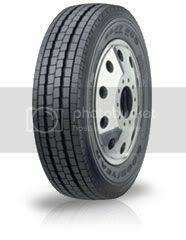 use either 225 MT's or Hankook DH01's or 245 Oliver Super Traction's or Hankook DH01's. I'm hopping to try a set of the 245 MTR's. 245/75/R16 Michelin LTX A/T Load range E, and I Love em! You cant wear them out! Im looking in the 245/70/19.5 sizes. Here's the only downside to the 245/70/19.5's; you're supposed to run them on a 6.75" wheel, and the stock wheels on our HD's are 6". With that said, I'm running 245/70/19.5's and they seem to fit OK although it's obvious they're wider than should be on the given wheel. If I get a real heavy load in the back they do stand a chance of rubbing sidewalls, too. I've got Goodyear G647-RSS on mine, load range G, these are supposed to be Goodyear's "superb choice for high-scrub applications" which I consider close-quarters wrecker work to be - lots of manuevering. With the weight of the HD itself and the wrecker unit and framework, plus towing around heavy trucks al the time, I figure G range is the way to go. 4410 lbs. each in a dual config., 4540 single, though I probably won't be running them at the max 110 PSI! Yikes those wouldn't a darn thing for me but run up a large wrecker bill . . . So they all last a fairly good amount of pavement miles. . .
cost ranges from $120/tire-$180/tire. most i ever paid for a 19.5 was $225. Now 16's in the same treads cost $200-$250/tire and only last 25-35,000 miles. Not sure what you meant by that since you didn't explain, but yes, that's what I run. i was just wanted to make sure i had the right photo . . . I'm guessing you don't leave the paved road's much ? Im going to look into some wider wheels. Im wanting a high traction, floatation type tire. Richard, are you saying 245's with stock wheels loaded down will rub ? They ride pretty close so I'm sure if you put an HD-sized load on them they will probably rub when used on the 6" wheels. If you look up tire specs on a 245/70/19.5 you'll see the recommended wheel width is 6.75", where the stock 225/70/19.5 is recommended to a 6" wheel. The forged aluminum wheels that Ricksons sell are 6.75" but they're gonna cost you $400+/ea unless you can find a different source for a 19.5 aluminum with the 10x7.25" (and 5.25" bore) pattern. Mind you they've got them in steel too for like $260/ea. The aluminum are about half the weight of the steels so that would be nice. I wish I could afford a set; I'd have the aluminum 6.75" wheels all around on mine right now. I've noticed some of the steel wheels Ricksons sells are just Accurides; stands to reason they may have sourced the aluminums from outside vendors as I seriously doubt they make them and are the sole distributor for them. Some slight chance of finding them cheaper elsewhere. you can get 19.5's locally for a lot less money, new steal's are about $125 new alloy's are $250 . . . slavage yards toss them out for $25-$100 depending how nice the tires are . . . I got a set of 6 once for $60 as they like new Biasply Mudder's, salvage yard guy's was like nobody run's these obsolete tires any more, i said i'll give ya $100 for'em he said make it $60 cash n git before i change my mind . . . Isn't there other ford and/or dodge 19.5 steel wheels that fit our rigs? They look the same and fit right on.....Anyone? I'd like to know that one also,,,,I know in the std 3500 series the 8 lug wheels would also bolt up, but the Ford had a larger hub hole diameter. If you take a look at the wheel specs, the bolt circle and hub bore of the other makes are not compatible. One of the older Ford 10 lug 19.5's has the same bolt circle, but the hub bore is wrong, which is crucial since these are hub-piloted wheels.